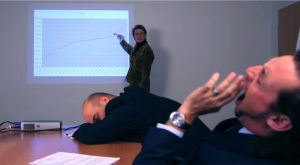 Your Sales Presentation Is Commoditizing You! We’ve all been there, and we’ve all done it more times than we’d like to admit. Like pulling out the slides from the family vacation, we begin our sales presentation. Sales presentations are quickly catching up to sales brochures for the lead in traditional sales tools that make selling harder. Both pieces suffer from the same root problem. The focus is on communicating value, rather than creating it. They're both designed to tell prospects/customers what you will do. But think about it (and be honest); can't your competitors say they will do the same basic things you say you do? My bet is that they probably already are. So kill the sales presentation and instead develop the tools that allow your salespeople to bring your value proposition to life. As I tell my clients, "Stop telling people that you're a rock star, and start demonstrating it." Sales tools should enable your prospects/customers to experience your value. When they experience it, you won't need to explain it; and as a result you'll make sales faster, and you'll break free from the "what's it cost paradigm," and enjoy the "what's it worth paradigm." The Diagnostic Scorecard™. The Diagnostic Scorecard is an easy-to-use and extraordinarily powerful tool that uses 10 simple statements that enables your prospect/customer to quickly identify and understand problems that aren't clear to them. It opens the conversation and clearly lays the foundation to understanding your proposition. You can see a sample scorecard here. The Cost Calculator Worksheet™. A cost calculator worksheet can be used collaboratively or individually. It turns symptoms, frustrations and concerns into full-fledged, fully defined problems. It structures a conversation so the prospect/customer can quickly see the impact and multiple consequences of the failure to address key issues. You can see a sample here. The ROI Worksheet. Just as the cost calculator worksheet makes the cost of the problem clear, the ROI worksheet clarifies the value of solving the problem. What's critical in making this worksheet effective is that it must use numbers and/or assumptions that come from the customer. You can see a sample here. As you'll see from these three samples, effective sales tools put the salesperson into the position of leading/facilitating a conversation, rather than peddling. It creates structure that allows the prospect/customer to stay in the driver’s seat while discovering the value of your solutions. So, skip the new brochure and throw away the sales presentation, and start building your sales toolkit.